Lightjet Print on Endura Metallic Paper. 12-1/4 x 8 inches. Shot for an exhibition with a simple premise: self-portraits of artists wearing their favorite clothes. I’ve been working on a series of self-portraits over the past few years. The last few months have presented me with a level of stagnation heretofore unseen in my artistic life. In what was to be an admission of complete frustration with and ultimate ending of my self-portrait series, I gathered the various substances I’d been using all summer to keep my hands and mind occupied, sat in my living room window and took in each. 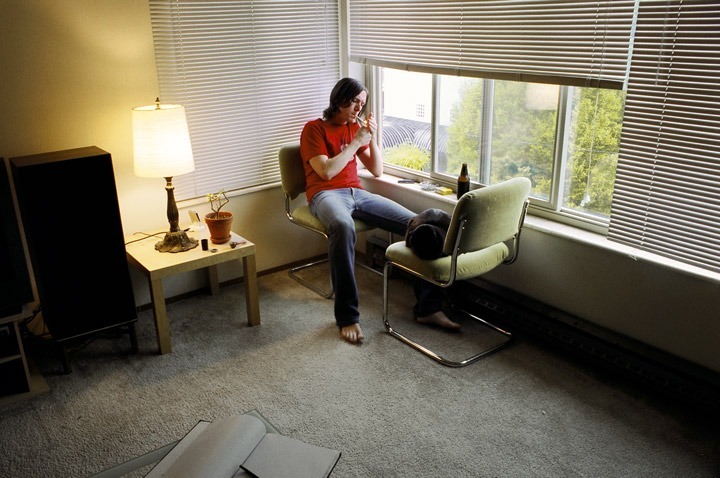 Over the course of four rolls of film, I documented the inhalation of marijuana smoke through my glass pipe, the drinking of several cheep beers, and nearly a half-pack of cigarettes sucked deep into my lungs. I wore my most comfortable clothes.